Includes everything ready to drop in to your favorite Strat® by simply hooking up the hot wire (audio) and ground wires. Includes genuine #099-2114-000 Fender® Custom Shop Custom '69 pickup set, genuine Fender® pickguard, knobs, switch tip along with top quality CTS potentiometers, Orange Drop polyester film tone capacitors and a CRL pickup selector switch. The standard 11 hole pickguards are fully shielded as they come from Fender. The '65 vintage, '62 vintage and '57 vintage pickguards require a separate aluminum pickguard shield which is to be added extra if so desired. Use separate "Add to Cart" buttons found below (bottom of page) for addition of these pickguard shields. 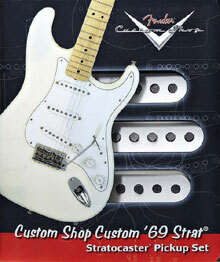 Pickup Set: Genuine Fender® Custom Shop Custom '69. As of mid 2011 the Custom '69 pickup sets are no longer being dated and initialed by Abigail Ybarra, they are still exactly the same in construction and design, but will no longer bear Abigail's inspection markings on the bottom plate. This information comes directly from Fender, if you have any questions to this change please call Fender® direct at 480-596-7195. 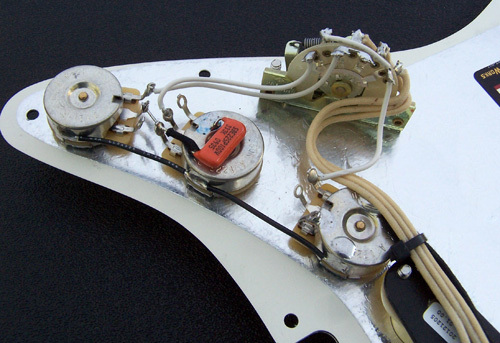 Important Note: If you are selecting your pickguard assembly to be built with one of the '62 or '65 or '57 vintage pickguards they are unshielded as provided by Fender. To have the genuine Fender® aluminum '62 pickguard shield or '57 control area shield installed please add it separately below using the appropriate "Add to Cart" button. The '62 vintage aluminum pickguard shield is a full pickguard coverage shield and is appropriate for the '62 or '65 Strat 11 hole pickguards. 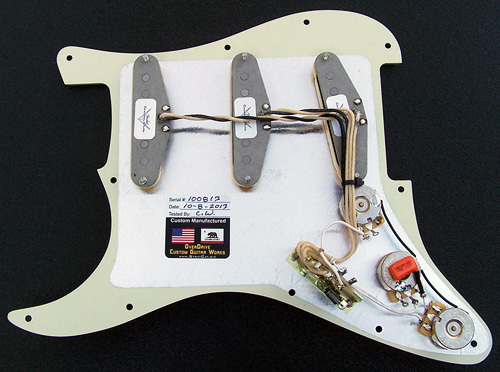 The '57 vintage aluminum pickguard shield is a control area only shield for the '57 Strat 8 hole pickguards. These shielding's are specific and authentic to how they were originally built by Fender® during the respective era. 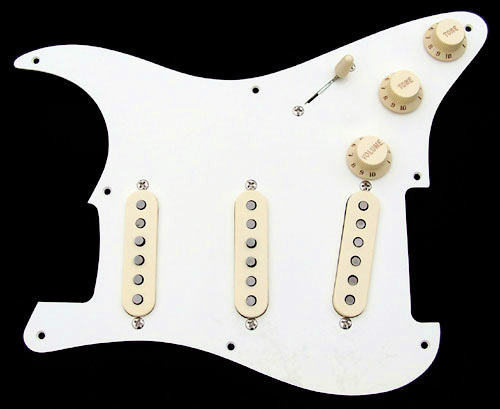 To add the aluminum pickguard shield for the '62 or '65 vintage Strat pickguard. $17.00 Up charge. To add the aluminum pickguard control area shield for the '57 vintage Strat pickguard. $7.00 Up charge.